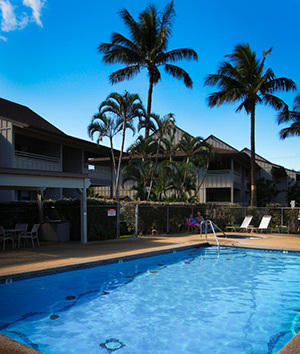 Kihei Bay Vista is a charming 60-unit condominium complex in Kihei in South Maui, with four buildings facing manicured grounds. The grounds of this charming complex are lush and tropical and offer an outdoor pool, a hot tub, a picnic pavilion and BBQs. Kihei Bay Vista is across the street from the beach and is within walking distance to the Whale Sanctuary and Kalepolepo park. It is a quick hop to some of Maui’s finest restaurants, shops, supermarkets, golf courses and world class beaches.